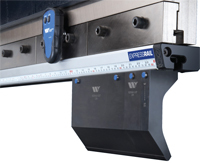 fabricators can improve productivity from their press brakes by installing the new ExpressRail hydraulic clamping system from Wilson Tool, White Bear Lake, MN. With pushbutton clamping and seating, operators spend more time bending and less time setting up, leading to increased uptime and enhanced productivity. And, the low-profile design of the ExpressRail doesn’t eat into the open height required for larger parts.